Kiwi was the only bird I was interested to see when I was going to New Zealand. But I read about couple places where it is possible to see penguins in New Zealand when I was planning my last trip around South Island. It is not Emperor penguins, but much smaller – blue and yellow eyed penguins. But still it was interesting to see them, because I never saw any penguins in the wild. So I added some places to my route. 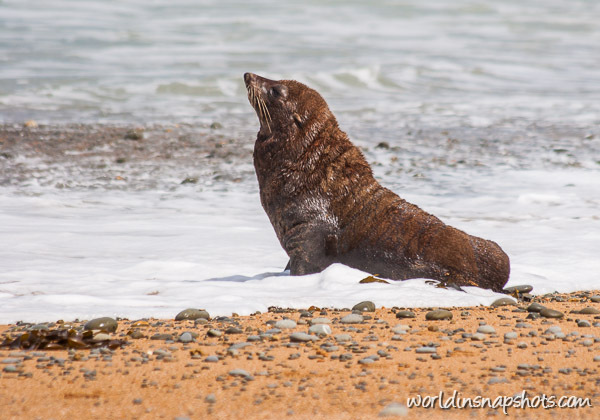 Probably the best place for penguin watching in New Zealand is Omaru town. It is located south of Christchurch in the South Island. It is possible to see both kind of penguins there. Every night they are coming back from the sea to the land and you can watch both kinds at the same night. 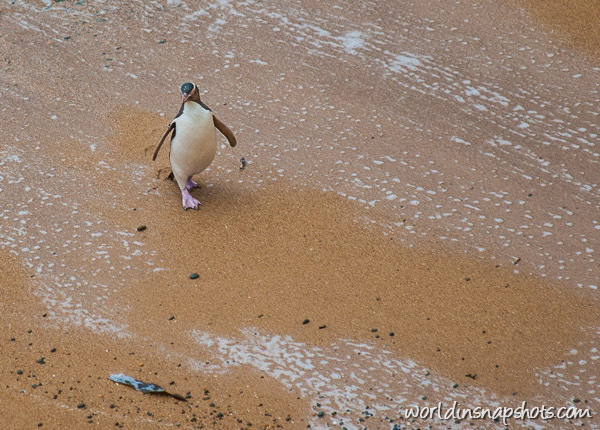 Their colonies are on different sides of peninsula, but yellow eyed penguins are coming back 1-2 hours earlier then blue eyed penguins. An hour before sunset go to Bushy Beach (about 5 minutes driving from city center) and wait in the hides for yellow eyed penguins appearing from the sea. After sunset go to blue eyed penguins colony. You can watch penguins there for a fee. I didn’t find any place where it would be possible to see blue eyed penguins in the wild for free in New Zealand. Let me know if you heard about such place. Also you can visit this web site (www.penguin.net.nz) for other places there it is possible to see yellow eyed penguins. How very cool. I did this type of adventure in La Serena in Chile. We saw a penguin colony. Yes, they are so cute, though I didn’t think they are such small creatures. Amazing! It’s on my bucket list to run with penguins. They’re so cute. I had no idea I could see them in New Zealand though! So cute! I love penguins and really want to see them in the wild!